As the wet season progresses and the thunderheads disappear, the sky over Broome is instead filled with growing clouds of gossamer wings, some gold, some black, or glittering in metallic shades of red, blue and bronze. With the approaching dry season, dragonfly numbers explode across the Kimberley as the water-borne larvae climb out of their swamps and burst from their skins as adults. Suddenly the town seems invaded by battalions of miniature biplanes fighting their own private battles in the humid tropical air as they defend their territory, search for a mate, and hunt down airborne prey. The dragonflies are harmless to humans but, unless you share their flying skills and appetite, watch out for the mosquitoes that make up the bulk of the dragonfly’s meals, in case you become mossie fodder yourself. While the cool south-easterly winds are always associated with increased mosquitoes – and the ripening of the Grey Mangrove fruit was a signal for Aboriginal tribes to shift camp to the beaches to escape their bites – this year the mossie invasion brings with it an extra sting: The WA Department of Health’s surveillance program has detected widespread activity of Murray Valley encephalitis (MVE) virus and Kunjin virus, as well as less-severe Ross River Virus and Barmah Forest Virus disease. Department of Health Medical Entomologist Sue Harrington said recent rainfall and flooding in the northern half of the state had resulted in large numbers of mosquitoes that could be carrying these viruses. While the risk of infection is low, the symptoms are severe. “Initial symptoms of MVE include fever, drowsiness, headache, stiff neck, nausea and dizziness, and people experiencing these symptoms should seek medical advice quickly. In severe cases, people may experience fits, lapse into a coma, and may be left with permanent brain damage or die,” she said. Kunjin virus fever is usually less severe but with similar symptoms. Many cases of Ross River Virus disease have been notified in people from the Kimberley and Pilbara regions, and cases of Barmah Forest Virus disease are also being notified from the Midwest region. The illnesses caused by these viruses are similar, with symptoms including painful joints, aching muscles, lethargy, fever, headache and skin rashes, and symptoms may last from days to months. 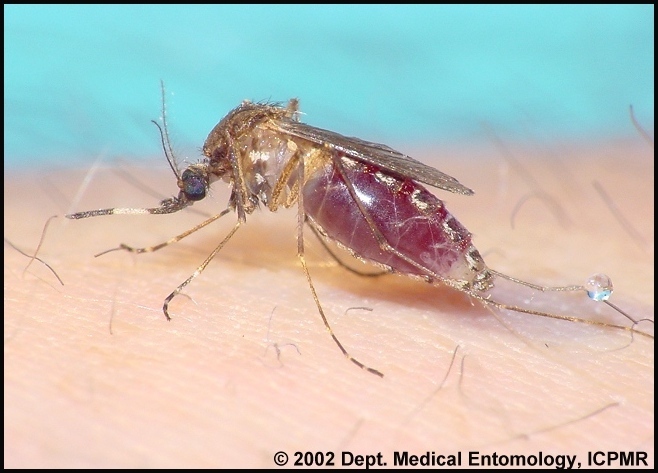 “There are no specific cures or vaccines for any of these mosquito-borne diseases so it is very important that people take care to prevent being bitten by mosquitoes,” said Ms Harrington. For humans, the best defence is to avoid being bitten, by staying the safe side of a fly screen at dusk and dawn, wearing long, loose-fitting clothes and using protective lotions and gels. Luckily for us, the delicate-looking dragonfly, which appears so fragile and decorative, is actually a fierce killing machine doing its best to reduce the mosquito population. Dragonflies lay their eggs on or around water, and these hatch into larva or nymphs that live in the water. Some larvae moult up to 15 times before emerging as an adult and, unlike most other insects, there is no pupal stage; they simply climb out of the water, attach themselves to a plant, and burst out of their skins as fully formed adults. This transition from larva to adult is known as incomplete metamorphosis. At least two months is needed for eggs to reach adulthood, but some larva may spend more than a year underwater before emerging. The adult stage is usually the shortest in the life-cycle and rarely lasts for more than a few weeks. However in that short time they are awesome hunting machines, catching insect prey in the ‘net’ of their forward-facing front legs and displaying incredible flying skills, made possible by their four unconnected wings that move independently, allowing them to change direction in a split second. The bad news is that even a sky-full of Kimberley dragonflies cannot wipe out the huge numbers of mosquitoes – especially after this year’s long wet season – but imagine how much worse the mossies would be without them. Dragonflies have existed on earth for about 250 million years – that means they were around long before dinosaurs left footprints at Gantheaume Point. Prehistoric dragonflies were huge, the largest flying insects ever, with wingspans of 70-75cm. One reason dragonflies have survived for so long is their excellent hunting skills; they can hover, move in zigzags and even fly backwards. 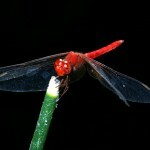 Some dragonflies can reach speeds of 70km per hour. 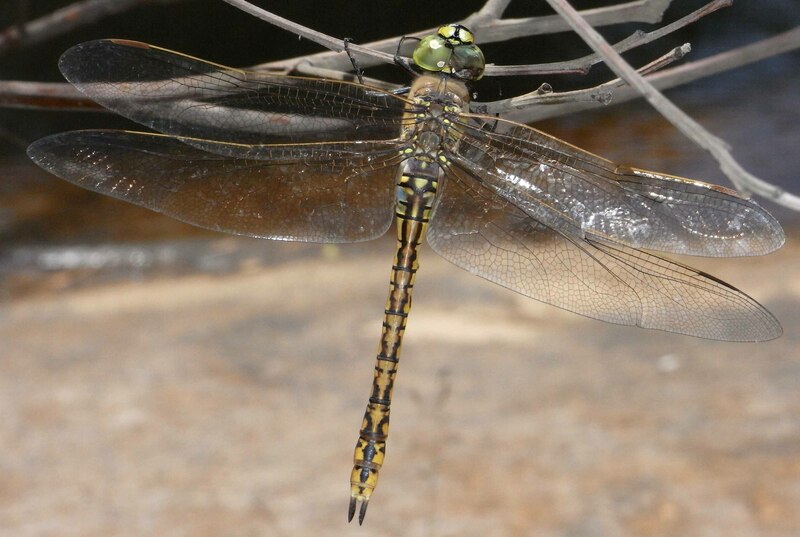 Of the 6,000 species of dragonflies, 324 are found in Australia. The biggest living dragonfly is found in Central American (about 19cm) but Australia boasts the bulkiest dragonfly, the Giant Petaltail from Queensland (Petalura ingentissima), with a wingspan (in females) of about 16 cm. 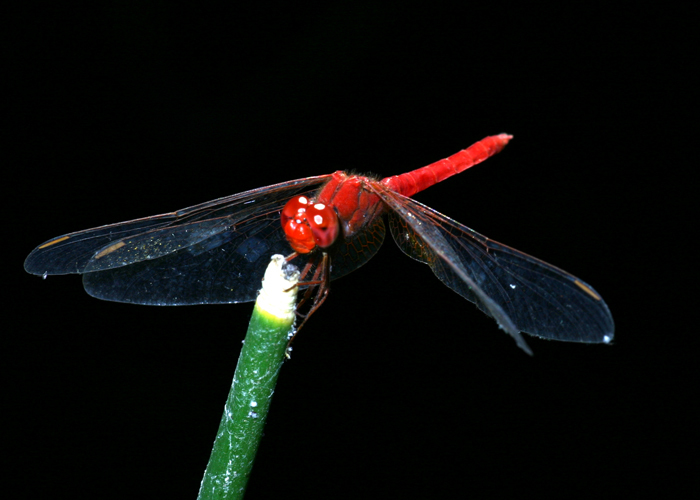 Perhaps the smallest Dragonfly is the Scarlet Dwarf (Nannophya pygmaea) from Malaysia and Japan. It is 15mm long with a wingspan of about 20mm. Dragonflies may challenge the Wanderer butterfly for the longest migratory pattern of any insect, with one species thought to travel 18,000km between India and Africa on monsoonal winds. Avoid outdoor exposure from dusk and at night. Wear protective (long, loose-fitting) clothing outdoors. 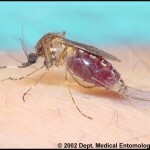 Use a personal repellent containing diethyl toluamide (DEET) or picaridin. Lotions or gels are best. Most natural or organic repellents are not as effective. Ensure insect screens are installed and completely mosquito-proof. Use mosquito nets and mosquito-proof tents. Ensure infants and children are adequately protected against mosquito bites, with suitable clothing, bed nets or other forms of insect screening. Dragonflies are in the sub-order Anisoptera (meaning “unequal-winged”) and the hind wings are usually shorter and broader than the forewings. Damselflies are insects in the sub-order Zygoptera (meaning “paired-wings”) and all four wings are roughly equal in size and shape. Dragonflies are usually large, strongly flying insects often found well away from water; damselflies are usually small, weakly flying insects that stay close to the water. 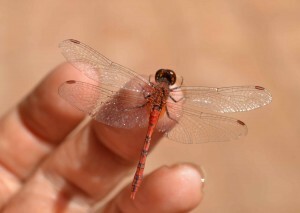 When at rest, dragonflies hold their wings out from the body, often at right angles to it. Most damselflies hold their wings along their bodies. Dragonflies eyes are large and usually touch. Damselfly eyes never touch. Damselfly larvae have external plates at the end of the abdomen that act as accessory gills; dragonflies do not. British-born, schooled in Holland and Wales, I worked my journalism cadetship in the Home Counties, escaped to London, then spent a couple of years travelling before settling in Melbourne, where I have written and edited for a range of publications, including Pacific Magazines [Your Garden, Home Beautiful, New Idea] and Fairfax Community Newspapers. Now a mother of two wonderful teenagers, I write about gardening, sustainability and people, when I can drag myself away from the vegie patch and my saxophone.